We are delighted to offer you exclusive access to our Club Lounge, located on Floor 5. Enjoy a complimentary Continental Buffet breakfast, hot and cold beverages, evening cocktails, hors-d’oeuvres, wireless Internet access and more; exclusively for the guests of Club Rooms & Suites. The Club Lounge is accessible 24 hrs. exclusively for the Club Floors rooms. Enjoy breakfast with a selection of juices, assorted pastries, cold cuts, varied cereals, coffee, tea and fresh fruits. Take a break and taste the assorted sweet and savory snacks and fresh fruit, coffee, tea and soft drinks. Taste our daily changing hot & cold hors-d’oeuvres a paired with wine and soft drinks. Finish your day with assorted sweet and savory snacks and fresh fruits coffee, tea and soft drinks. office supplies are ready to go. bathrobes or shorts are not allowed. 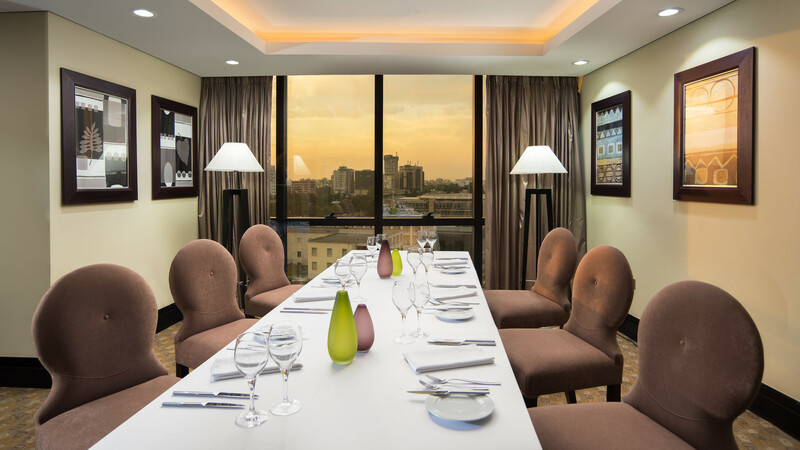 Ideal for your business meals, our Private Dining option at the Club Lounge gives you the utmost privilege of privacy and high-end service.